OTTAWA, Nov. 27, 2018 /CNW/ - Kinaxis® Inc. (TSX: KXS), provider of RapidResponse®, the recognized leader in digital supply chain management for concurrent planning, has won a 2018 Digital Innovation Award for its Self-Healing Supply Chain™. 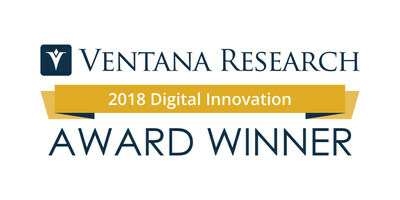 Presented by Ventana Research, Kinaxis is honored in the category of Operations and Supply Chain, which highlights a technology vendor that best exemplifies innovation in technologies that support the operations or service of supply chains. Released in May 2018, the Self-Healing Supply Chain uses purpose-built machine learning technology to surface complex dependencies and patterns across billions of data elements driving supply chain performance. It closes the gaps between expected and real-world performance and is critical in predicting revenues, satisfying customer demands and maximizing financial performance. "Our awards showcase the best in innovation and this year's winners are raising the bar on how digital technologies can enhance business performance by driving improved outcomes in critical business processes," said Robert Kugel, Senior VP, Research Director, Ventana Research. "The Kinaxis Self-Healing Supply Chain demonstrates the important relationship between humans and machines. Enabling routine tasks to be automated with artificial intelligence and machine learning frees up supply chain managers to focus on more strategic tasks. Their time is better spent dealing with more complex situations that require their insights and hard won experience." Ventana's annual Digital Innovation Awards identify the technologies that make the most significant impact in their respective markets. Ventana bases its selections not just on an innovative technology approach, but how it applies to people, processes, information and technology, the best practices it supports, the degree of team involvement, and the technologies, business impact and value. Award winners were selected based on the extent to which they help organizations innovate or enhance the productivity and outcomes of their business or IT processes. "It is an honor to be recognized by Ventana for the innovation displayed with the Self-Healing Supply Chain," said Jay Muelhoefer, Chief Marketing Officer, Kinaxis. "This award is a testament to the expertise of the Kinaxis team and their understanding of the complex problems our customers face every day to gain visibility and insight into their supply chain to drive business objectives and stay ahead of the competition."